Surgery can be a real bear. Even for a bear. 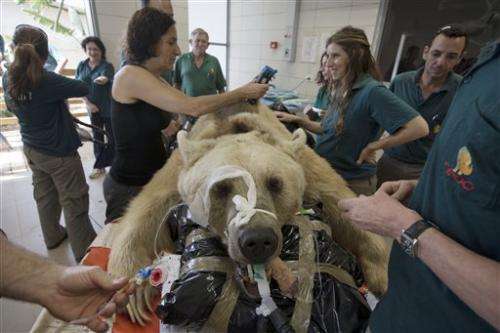 In Israel, a 19-year-old Syria brown bear named Mango underwent surgery Wednesday to repair a herniated disc, said Sagit Horowitz, a spokeswoman for the Ramat Gan Zoological Center near Tel Aviv. Zoologists first noticed Mango had a problem when he started to show signs of paralysis in his hind legs in the last few weeks, said Dr. Merav Shamir, who led the surgery on the furry patient. "It started acutely," she said. "He wasn't able to move his right hind limb and it progressively deteriorated over the following 48 hours to become completely paralyzed on the hind limbs." Horowitz said veterinarians discovered the 250-kilogram (550-pound) bear had the injured disc during an X-ray taken after noticing his worsening paralysis. That disc compressed Mango's spinal cord and caused the paralysis he had been suffering through, Shamir said. 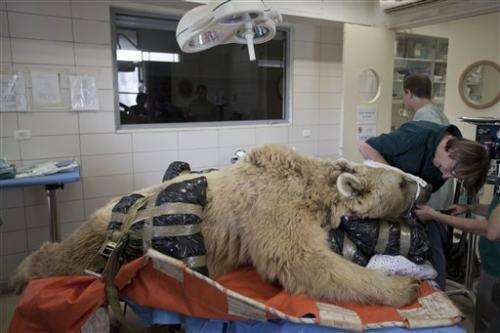 Veterinarians shaved parts of the bear's furry back to prepare him for surgery Wednesday, as well as intubated him. 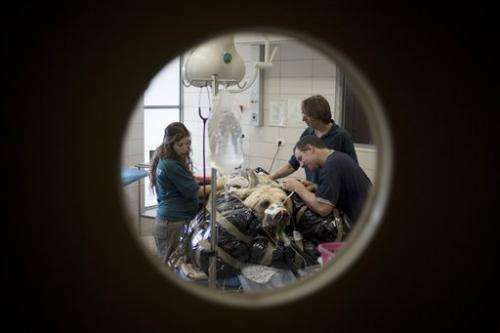 They propped his head up on a pillow wrapped in a trash bag and put an IV through his snout. They also wrapped a blood-pressure cuff around his right paw. Such unique procedures aren't uncommon at the Ramat Gan Zoological Center, the premier zoo of Israel. Last year, veterinarians there used acupuncture to cure the chronic ear infection of a 14-year-old Sumatran tiger named Pedang. Shamir said other bears with a similar disc problem like Mango had been euthanized and that the surgery he underwent was novel for bears—though often performed on small dogs. "I'm nervous now—I'll be happier in a few hours," Shamir said before the hourslong surgery began. "I wish him luck." Veterinarians will know in the coming weeks whether Mango makes a full recovery.